A £1.3bn investment deal for Swansea and south west Wales could be agreed by 27 March, the chancellor has said. Supporters of the proposed Swansea Bay Region city deal were disappointed that it was not included in Philip Hammond's Budget on Wednesday. He told Plaid Cymru MP Jonathan Edwards in a letter he was "over-optimistic" to say the deal might be ready so soon. Mr Edwards warned it would be deferred until after May's local elections if it is not agreed "in the next few days". The proposals aim to create thousands of jobs in Carmarthenshire, Neath Port Talbot, Pembrokeshire and Swansea. In his letter to Carmarthen East and Dinefwr MP Mr Edwards, Mr Hammond wrote: "My understanding is that the negotiations are aiming to conclude the deal by March 27, when the local election purdah period begins [when rules limit government activity during the campaign]." The UK government's adviser on the deal, former Deputy Prime Minister Lord Heseltine, was sacked earlier this week but ministers say that won't affect the deal. 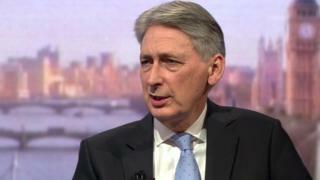 Mr Hammond wrote: "The government is fully committed to agreeing a deal that will help to enable growth, create jobs and bring private sector investment to the region. "Each city deal is bespoke and we need to take the time to ensure that we deliver the right deal for the Swansea Bay city region." Mr Edwards said: "Councils in the region will enter purdah before the 27 March which would prevent them from formally signing the city deal, resulting in the entire deal being deferred until after the council elections. "This could see the four authorities in the region having to go through the entire democratic and legal process all over again, causing significant delays at best, but at worst risks hundreds of millions of pounds of private investment which has been secured for the deal. "I would urge the UK Government to move urgently to agree this deal in the next few days." On Wednesday, Wales Office Minister Guto Bebb said the deal would be given approval by the end of 2017. He told The Wales Report, on BBC One, there were some things that needed to be "tweaked". "There are some issues that need to be tweaked and improved but I am confident that we will have a good deal for Swansea which shows that Westminster not only delivers for the capital city of Wales but also for Wales' second city." He added: "I am confident that we will also have a cross-border growth deal for north Wales as well." Cllr Rob Stewart, leader of Swansea council, said the deal would "improve people's lives" by generating up to 10,000 jobs and investing in technology.